April 10, 2015: Extreme changes in diving pressure generated during a seaquake caused barotrauma in the cranial air sinuses of a pod of melon-headed dolphins on 22 March (see below). Because they use the air in their sinuses and air sacs serve as acoustic mirrors bouncing, focusing, and channeling returning echo location and navigation clicks in a fashion to make their biosonar work, a pressure-related tear in the membranes of these air spaces knocks out their navigation. They swim blindly downstream in the path of least drag arriving at a 6-mile stretch of Hokota Beach about 60 miles northeast of Tokyo Japan on Friday morning. Words of an AFP journalist at the scene revealed that the pod has no sense of direction. He wrote that despite efforts to push the dolphins to deep water, they were being washed back onto the beach by the incoming surface current (link). That they could not swim to freedom against the incoming flow indicates that they have no acoustic sense of direction. The encounter with shocks from an undersea earthquake disabled their biosonar system. The bottom line is the entire pod had been lost at sea since 22 March. The surfaces currents picked the stranding beach, not the whales (link). The short video below illustrates their predicament. And, as the pictures below reveal, at the time of the rescue attempt, there was a strong wind-driven surface current directing the surface waters towards the beach along with an incoming tide. Trying to release the lost dolphins against the incoming flow was doomed to failed. Trained rescue teams in the US and Australia always wait until the tide reaches its high mark and then starts to flow back out to sea. 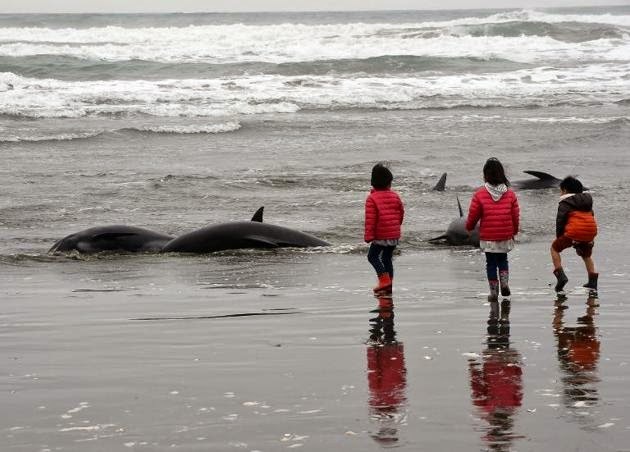 Another tell-tale sign that they have no sense of direction is the fact that stranded whales and dolphins never swim away from the beach unless the flow of current is back towards deep water. If pushed off when the current is incoming, the freed whales just turn around and come back to the beach. 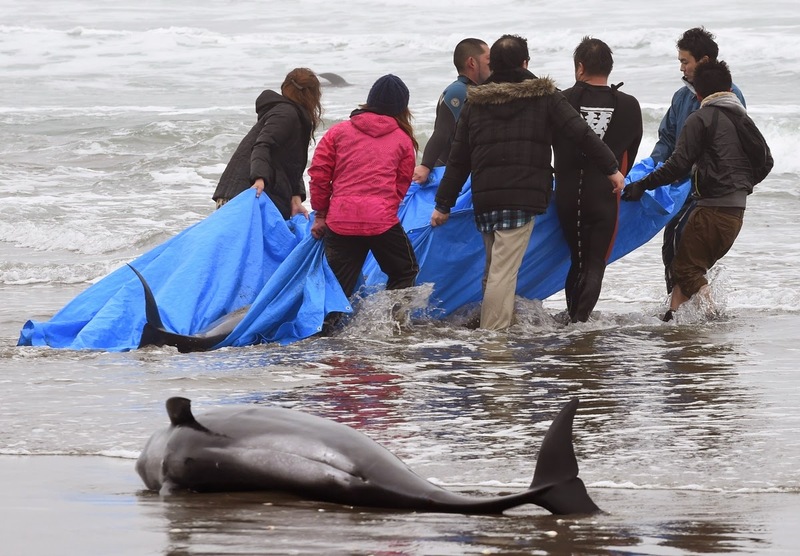 Professional rescue teams know that freed dolphins will swim away only if released when the outgoing tide and winds establish an outbound flow towards deeper water. Look at the two dolphins above the heads the children on the right. They are swimming freely with the longshore current that runs parallel to the breaking waves in the surf zone; they can swim in no other direct but downstream. The entire pod was as lost as would be 150 blind men tossed overboard 20 miles offshore. We know if a blind man swam into a flowing current; resistance (drag) to swimming against the flow would turn him around and point him head first in a downstream direction. Going downstream with the current is traveling in the path of least drag--the only way an animal can swim if it has no sense of direction. Most people have little experience swimming in a current. Swimming against a strong current wearing a blindfold is impossible because water is 830 times denser than air. This explains why many swimmers suffer exhaustion or even a heart attack trying to swim back to shore against the strong outflow of a rip current. Whale scientists and rescue teams never mention whether stranded whales were swimming upstream against the flow or downstream with it. And, they never tell you the outward flow of the current is mandatory if the rescue is to succeed. Although they know the truth, they will never reveal how impossible it would be for a whale with dysfunctional biosonar to swim against the flow. The reason is very simple. If you know the rescued whales have no sense of direction and no chance of survival, you will not donate money. That the whales are lost is not rocket science, you can see it in hundreds of videos with your own eyes. You just need to know a little about how water flows at a beach. Whale scientists, like in the video above, repeatedly tell you that the main pod follows a sick pod member ashore because they love each other so much. According to whale experts, mass stranded whales will not allow a member of their clan to die alone. This is a fabrication. The individuals in the Japan stranding are stretched out over 6 miles of beach. If they followed a sick one, you would expect they'd be bunched together near the ill one. Of course, the scientists that spout this nonsense never identify the sick whale. This statement is wild guess; it has no business coming from a so-called expert. How disgusting and embarrassing for a scientist to spout such utter nonsense on TV. Where is his research? How does one diagnose psychological problems in marine mammals? Can Dr. Yamada read the mind of the dolphins? Of course not. The obvious truth is that the entire pod has been injured in a fashion that disabled their ability to echo navigate. They are all dehydrated and have no fresh food in their stomachs. The problem is that our governments do not want to admit seaquakes are most often responsible because the awareness of seaquake-induced sinus barotrauma would eventually expose sinus barotrauma induced by sonar, air cannons, and explosives. Since we can review videos and verify we our own eyes that all mass stranded whales and dolphins swim downstream, we can safely assume that they have no sense of direction. This helps us understand why they beached because all we need to do is trace back upstream and look for what caused the pod to lose their ability to navigate. To answer this particular stranding, we will be looking in a known habitat for melon-headed whales to see if one of the following has occurred: (a) seabed earthquake, (b) volcanic explosion, (c) man-made explosion, (d) navy sonar operation, (e) oil industry air-gun survey, or (f) a violent impact with the water's surface by a heavenly body. Undersea earthquakes are the most common ocean disturbance and the first one to eliminate. It also helps us to know that melon-headed whales like to hang out along the edges of deep drop offs; they also like to visit nearby shallow water. For this reason, many pods of melon-headed whales have been observed offshore of Taiwan and off the Guam Island chain. This means that if there was a whale-dangerous earthquake off Taiwan or Guam, a pod of melon-headed whales might have suffered a pressure-related sinus injury that knocked out their biosonar. They would then beach themselves somewhere downstream of this event. In the hundreds of mass strandings the Deafwhale Society has traced over the last 40 years; we find the average downstream distance between a seaquake epicenter and the stranding beach is about 2,400 miles. The average time elapsed is 23 days. We think that when first injured, the whales are more mentally alert and able to use their eyesight to avoid shallow water. But after being chased by sharks for 3 weeks with no food or fresh water, they become less aware of what's in front of them and more concerned about the sharks closing in from behind. As it turns out, the main current flowing along Hokota beach also flows through the waters of Taiwan and Guam. 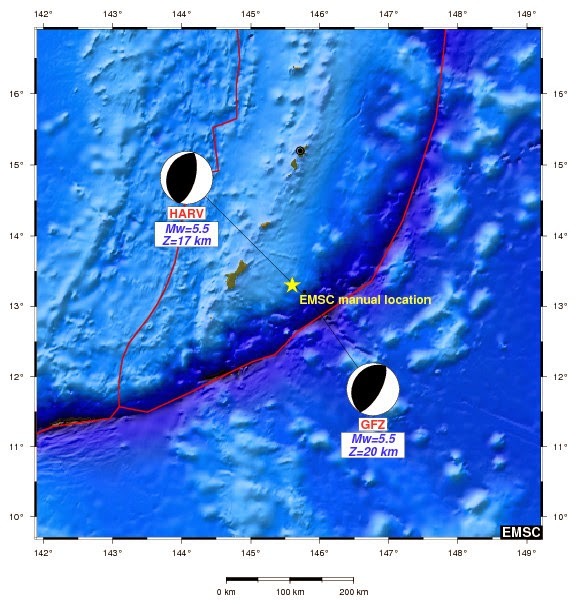 Thus, if there was a nasty seaquake near Guam and the time and distance traveled downstream also agrees with the stranding date, then this event becomes highly suspicious. The key factors to consider is the depth of focus, seismic motion in the seabed, magnitude, the timing of the quake, the flow and speed of the surface currents, the downstream distanced, and the date of the arrival at the stranding beach. This data must all fit together. 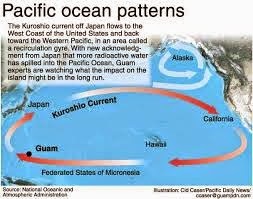 Like magic, we find that just such event did occur off Guam 19 days prior to the stranding and about 2,400 miles upstream from the stranding beach. Under ideal conditions, the pod could travel ~125 miles per day so the time and distanced fits with the stranding date. Since Guam is also a known habitat for melon-headed whales, this seaquake seems even more likely to be the cause of the beaching. The black and white beach balls show that this event was specially dangerous since it was vertical thrusting and likely generated a shock wave that could have easily damaging the cranial air spaces of the entire pod. A thrusting event is one in which the fault slips vertically. The intensity of any shocks are tied to the speed (acceleration) at which the fault ruptures in the vertical plane. The faster the fault slips, the more intense is the shock front. Download our latest scientific article to learn more about our solution to the centuries old stranding mystery, and visit deafwhale.com often.